4 Player Chess társasjáték - Magyarország társasjáték keresője! A társasjáték érték! A 4 Player Chess egy remek társasjáték, 4 játékos részére, az átlagos játékidő rövidebb, csak 45 perc. A társast, 8 éves kortól ajánljuk kipróbálni. A játékmenet erősen épít a rács mozgás és a játékos kiiktatás mechanizmusokra. Four-Player Chess (Four-handed chess, Chess-4, and 4-Chess) is often credited to Capt Charles Verney, who was the first known to have documented the game in England in 1881. Four-player versions of chess probably have existed for hundreds of years prior to Verney in one form or another. Verney's four-player board consists of three rows added to each side of a standard 2-player board, and four complete sets of chessmen in four different colors. Modern four-player boards and colored pieces are available from several manufacturers. In Verney's version (1881), 4 player chess was a partnership game, and the object was to checkmate both opposing partners at the same time. In modern variants, four player games can range from partners, to cutthroat (every player for himself), to temporary alliances at will. Starting configuration affects fairness (bias). The standard 2-player configuration of queen facing queen is biased in four player chess because there is only one axis of symmetry. Four player chess requires two axes of symmetry to be fair (unbiased). To avoid bias, Verney recommended a staring configuration of all queens on light (or all on dark) squares. Another unbiased starting configuration is all queens on the right (or all on the left) of the king. 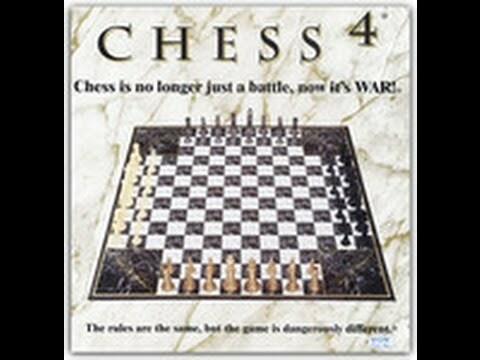 For the most part, four player chess follows (or can follow) all the normal rules of two-player chess. Verney had special rules for partnership playing, disallowed castling, and pawns had to make it to the enemies last rank in order to be exchanged for another piece. Pawns could also march up and back down the board. Verney also had checkmate as the ultimate move. In modern variations of four-player chess, partnering may not be required, but allowable, castling can be allowed, and actual capturing of a king a required move to eliminate a player. The Chess Federation does not recognize four-player chess in any form, and there are no official rules, so players are free to experiment with variations and make their own rules.